NANKANA SAHIB (PAKISTAN), Nov 15 ? The Chief Executive, Gen Pervez Musharaf, has given the green signal for constructing a 1.5- km-long corridor along the Indo-Pakistan border connecting Gurdwara Kartarpur Sahib?as proposed by the Aukaf Board? where Sikh devotees will be able to pay obeisance without a passport/ visa. This has been done to mark Yatri Year, to be celebrated all over Pakistan in 2001, in an apparent move to woo the minorities. In an exclusive interview to TNS, Lt-Gen (retd) Javed Nasir, Chairman of the Pakistan Gurdwara Prabandhak Committee (PGPC), said proper fencing along the proposed corridor would be done from the security angle. A 40-metre footbridge would also be constructed across the Ravi so that Sikh devotees could visit Kartarpur Sahib Gurdwara throughout the year. However, the Sikh shrine would be opened only during the day for a limited period. 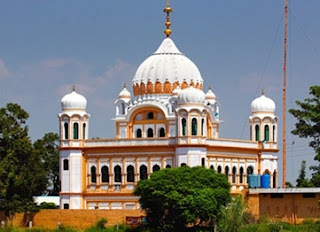 The Kartarpur Sahib shrine is located on the western bank of the Ravi. The gurdwara was built by Maharaja Bhupinder Singh, a ruler of Patiala state. During 1947, when it was still under construction, Partition took place and the work was stopped. The gurdwara became dilapidated. In the recent past, new minarets were constructed and a facelift was given to it. However, the gurdwara has not been opened to devotees so far. Lt-Gen Nasir claimed that the gurdwara could not be opened to devotees as its kutcha track, which remained partially under water, could be negotiated only by small vehicles. The PGPC Chairman said that the Government of Pakistan would write to Akal Takht Jathedar to take up the matter with the Indian Government so that it could allow Sikh pilgrims to visit the shrine without any hassle. Appreciating the proposal of the Pakistan Government to construct a corridor up to the gurdwara, Mr Paramjit Singh Sarna, a former President of the Delhi Sikh Gurdwara Management Committee, urged that this (corridor) should be extended up to Nankana Sahib so that Sikh devotees could have easy access to the birthplace of Guru Nanak Dev. Our Delhi Bureau adds: Official sources in New Delhi refused to comment on Pakistan's proposal to build a corridor along the Indo-Pakistan border to the Kartarpur Sahib Gurdwara. They said that the jatha which went to Pakistan earlier this month was not an official one. The government or any of its agencies had not received any such proposal from Pakistan so far.